I arrived back from Porto at around 5.30 this morning after a three hour bus ride having failed to secure a ticket in time for the afternoon bus. I had to be in Santiago today to get a few admin tasks tended too, and consequently I'm feeling pretty tired. However, Porto was truly wonderful. I spent Friday in the university and gave a talk in the afternoon, which was very enjoyable, even if the bulk of it was aimed at a minority of the audience. It's tough to give a specific research talk to a group who knows little about the generalities of your subject, so I gave a half hour introduction and then a half hour on the details of my last paper. After this I spent some time discussing with one of the researchers there about his recent work, and some possible extensions which I hope we will explore via email over the next few weeks. I left the department in the evening and walked over to the Casa da Musica, a striking contemporary building, to meet my couchsurfing host. We met up and did a little shopping in preparation for an evening feast with around ten of us. 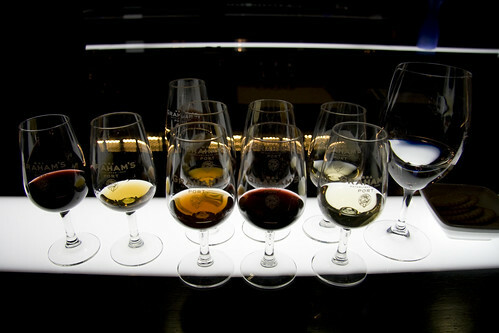 I was exceedingly lucky with my host, who was not only a lot of fun, and a very generous human being, but she happens to have a degree in the science of wine and winemaking and works at one of the major Port makers in the city as a tour guide when she isn't making her own wine in her family's estate. This meant that the weekend was a luxurious treat of learning and tasting some of the best wines of the region (produced in the Douro valley), as well as having a private tour of the port cellars and a tasting of a huge range of very very fine beverages. In terms of gastronomy, Portugal never suffers from any subtlety in its foodstuffs, and on Saturday as I walked around in the town centre, I spotted a cafe offering Francesinhas. I'd heard of these but wasn't yet aware of what they were. Never, to be scared by the unknown I ordered one (the waiter asked me if I just wanted one, to which I nodded, not knowing whether this would be enough). This must truly be the king of high calorie lunches, designed for a hard days labour. A Francesinha, ironically given the title 'little French girl' is prepared by taking: steak, minced pork, fried egg, sausages, sliced ham and thick slices of cheese, and putting the whole thing between two or more slices of bread. You then take this and drown it in cheese, so the whole thing is covered and you have to dig to discover that this is a carnivores delight. Take your meat-drowning-in-cheese-feast and pour a thick and spicy tomato sauce over the top. My guess is that this beast has around a 3000 calorie kick to it. Just in case you're not satisfied, it comes automatically with a plate of chips. Apparently by ordering it with a glass of water and not beer I may have caused some sort of gastronomic offense to the owners of the establishment! We then headed over to the other side of the river to spend a glorious afternoon Port wine tasting with my host, trying everything from dry white ports, great with tonic, to 30 year old tawnys and a deep rubys. The evening was spent at a chef's house, eating vegetarian cuisine which made me feel only slightly less guilty about the herd of animals which had been slaughtered for my lunch. The chef was also a tour guide for the Port cellars and so a fine selection followed the meal....do I see a theme emerging from this weekend?! yay! 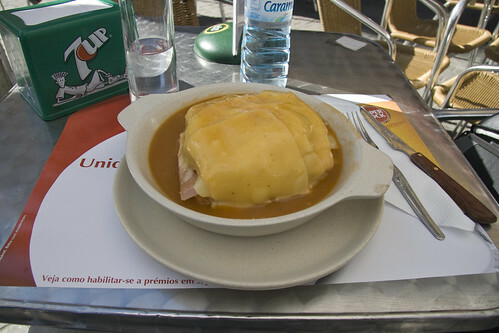 you did find the francesinha, well done! :D it's not something you eat everyday, but it's definitely a must try in porto. looking forward to read the rest of your adventures! I think my heart could only handle that about once a year!